The getting ready process was almost enjoyable, I gradually started getting more and more nervous about going to the church. I wasn't nervous about getting married but I was nervous about being the centre of attention, I'm the person that listens to conversations but doesn't say much. 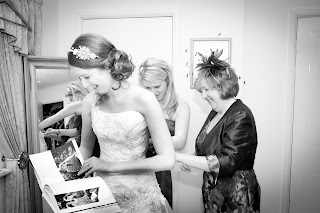 The part I enjoyed the most was getting my dress on, it was quite a hefty dress and getting it over my head wasn't the easiest of tasks for my mum and maid of honour. I love my dress, the thought of never wearing it again makes me incredibly sad. 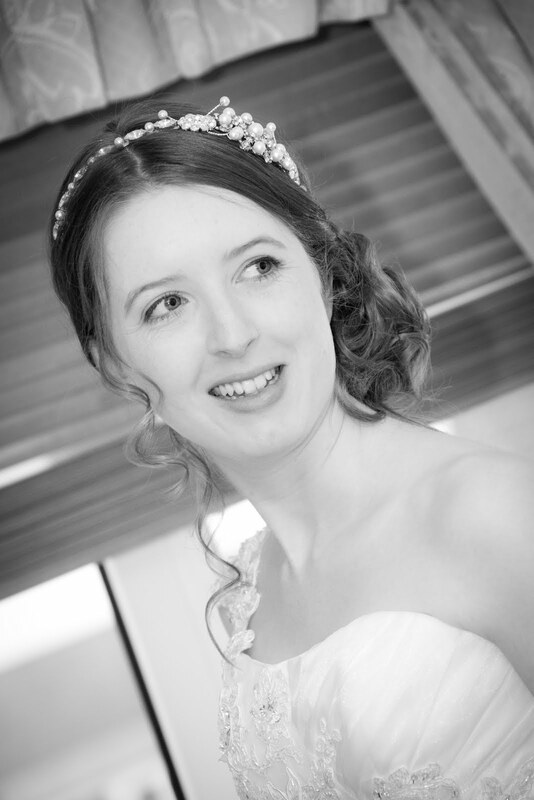 I'm wondering whether to do a cherish the dress shoot later this year just so I can wear it again. People have asked if I'm going to sell it but I honestly don't want to be parted from it, it's the most gorgeous thing I'll ever get to wear in my life. I decided against normal wedding shoes, the main reason was that all the ones I had seen were so boring! 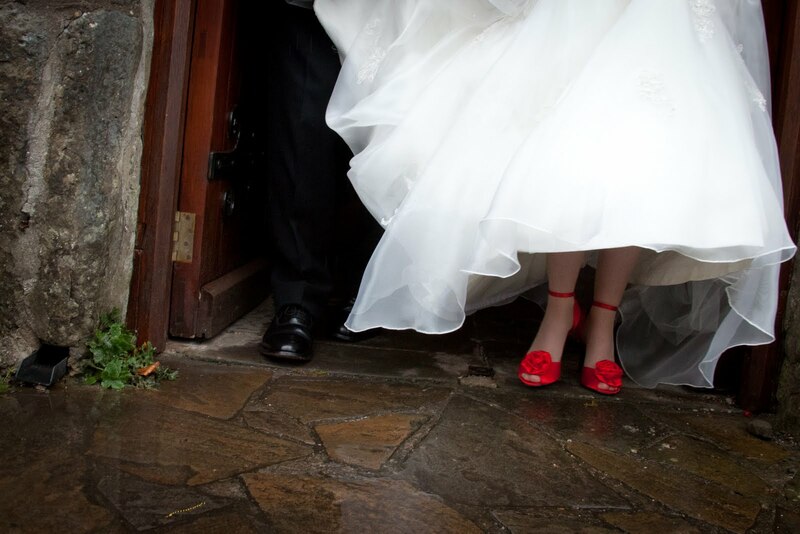 In the end I opted for bright red shoes, not because our theme was red and green, not because my husband is from Kansas (you can imagine the jokes) but because my favourite colour is red and I have a bit of a thing about red shoes. One of the main reasons I love my shoes is that I'll be able to wear them again unlike regular wedding shoes which you can really only wear them again if you dye them. I also decided against a regular tiara that so many brides wear, the only reason for this is that I really dislike them. They take the princess theme just a little too far for my liking, in the end I went for a 'side tiara' but really it's a hair band. 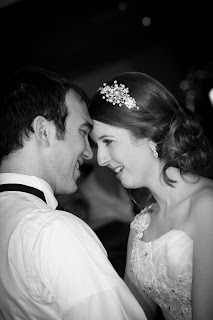 I adore it, it got so many lovely comments on the day. The only gripe I have about it is that by the end of the day my scalp behind my ears was hurting really badly but it's the price you pay for looking good! The vicar at the church was fantastic! 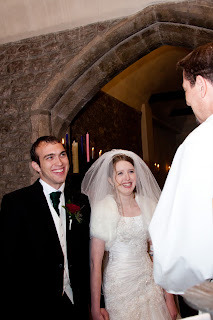 This is us having a bit of a laugh after we were married (he told us not to listen to each other and to listen to other people rather than the other way around). 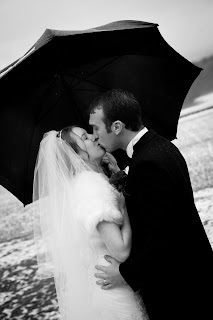 On our wedding day the weather did the unthinkable - it rained. Every bride's nightmare. The week before the wedding it had been snowing and looking lovely, the night before the wedding it poured down and almost melted all of the snow and left everything looking grey, to say I was gutted would be an understatement. But you know what? When I walked out of the church hand in hand with Matt it really didn't matter, what the weather is like on the day be it sun or rain it really doesn't matter. All that matters is that you've married the person you love. loved this post! 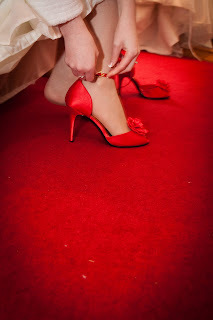 your dress is beautiful and i love the red shoes too. looks like you had an amazing day.